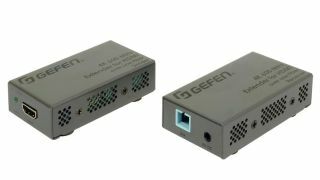 The What: Gefen from Core Brands is now shipping its new 4K Ultra HD 600MHz Extender for HDMI over one Fiber-Optic Cable (EXT-UHD600-1SC). The What Else: The EXT-UHD600-1SC supports 18.2Gbps of bandwidth and 600MHz TMDS clock frequency, the highest specified under the HDMI 2.0 standard. Full bandwidth support allows it to accommodate resolutions up to 4K Cinema-DCI (4096x2160 up to 60Hz, 4:4:4), and 4K Ultra HD (3860x2160 up to 60 Hz, 4:4:4) along with HDR-10 and Dolby Vision HDR. HDCP 2.2 and the legacy HDCP 1.4 are both supported; it also supports 1080p Full HD, WUXGA (1920x1200), 3DTV, and Deep Color (up to 1080p resolution). Highest performance multichannel digital audio, including 7.1 channels of LPCM and HBR (High Bit Rate) digital audio formats, such as Dolby Atmos, Dolby TrueHD, DTS:XTM, and DTS-HD Master Audio, are passed through to the HDMI outputs. The EXT-UHD600-1SC guarantees electrical isolation between the sender and the receiver, meeting the stringent safety and EMC requirements for critical applications. This extender can be powered from sources and displays featuring powered USB ports, or by using external power supplies. The sender and receiver are plug-and-play, and work without any setup. Compact enclosures are easy to install and can be hidden away. Their sturdy metal enclosures help provide further immunity against electromagnetic interference (EMI) and radiated noise (RFI).